Yichang (Chinese : 宜昌 ; old postal name 'Ichang') is a prefecture-level city located in western Hubei province, China. It is the second largest city in the province after the capital, Wuhan. The Three Gorges Dam is located within its administrative area, in Yiling District. As of the 2010 census, its population was 4,059,686 inhabitants whom 1,350,150 lived in the built-up (or metro) area made of Yiling, Xiling, Wujiagang and Dianjun urban districts as Xiaoting District is not urbanized yet. The Warring States period was an era in ancient Chinese history characterized by warfare, as well as bureaucratic and military reforms and consolidation. It followed the Spring and Autumn period and concluded with the Qin wars of conquest that saw the annexation of all other contender states, which ultimately led to the Qin state's victory in 221 BC as the first unified Chinese empire, known as the Qin dynasty. Although different scholars point toward different dates ranging from 481 BC to 403 BC as the true beginning of the Warring States, Sima Qian's choice of 475 BC is the most often cited. The Warring States era also overlaps with the second half of the Eastern Zhou dynasty, though the Chinese sovereign, known as the king of Zhou, ruled merely as a figurehead and served as a backdrop against the machinations of the warring states. Qin was an ancient Chinese state during the Zhou dynasty. Traditionally dated to 897 B.C., it took its origin in a reconquest of western lands previously lost to the Rong; its position at the western edge of Chinese civilization permitted expansion and development that was unavailable to its rivals in the North China Plain. Following extensive "Legalist" reform in the 3rd century BC, Qin emerged as one of the dominant powers of the Seven Warring States and unified China in 221 BC under Shi Huangdi. The empire it established was short-lived but greatly influential on later Chinese history. Bai Qi, also known as Gongsun Qi, was a military general of the Qin state in the Warring States period of China. Born in Mei, Bai Qi served as the commander of the Qin army for more than 30 years, being responsible for the deaths of over one million, earning him the nickname Ren Tu. According to the Shiji, he seized more than 73 cities from the other six hostile states, and to date no record has been found to show that he suffered a single defeat throughout his military career. He was named by Chinese historians as one of the four greatest generals of the Warring States period, along with Li Mu, Wang Jian, and Lian Po. The Guangxu Emperor, personal name Zaitian, was the tenth emperor of the Qing dynasty, and the ninth Qing emperor to rule over China proper. His reign lasted from 1875 to 1908, but in practice he ruled, under Empress Dowager Cixi's influence, only from 1889 to 1898. 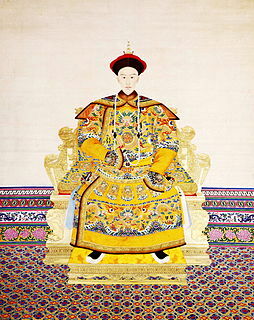 He initiated the Hundred Days' Reform, but was abruptly stopped when the empress dowager launched a coup in 1898, after which he was put under house arrest until his death. His regnal name, "Guangxu", means "glorious succession". 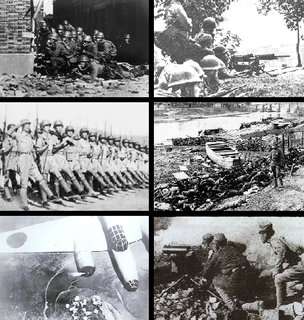 The treaty ports refers to the port cities in China and Japan that were opened to foreign trade by the "unequal treaties" with the Western powers, as well as cities in Korea opened up in similar fashion by the Japanese Empire. Dangyang is a city in western Hubei province, People's Republic of China, lying 70 kilometres (43 mi) east of the Gezhouba Dam on the Yangtze River. During the Western Han Dynasty. Emperor Jing of Han established an administration in Dangyang on an area of 2,000 square kilometres (770 sq mi). In 1988 the State Council of the People's Republic of China elevated this from a county to a county-level city, and is currently under the administration of the prefecture-level city of Yichang. Zhijiang is a county-level city of Yichang City, in the west of Hubei province, People's Republic of China. Until the 1990s Zhijiang was a county. It is located on the left (northern) shore of the Yangtze River, downstream from Yichang center city. Yichang Sanxia Airport is located in the Xiaoting District of Yichang City, 26 km (16 mi) away from the city center and 55 km (34 mi) from the Three Gorges Dam site. The airport is conveniently located, which borders Yihuang Highway in the north, Long River Golden Waterway in the south and Jiaozhi Railway in the east. The Yichang East Railway Station, opened in the late 2010 in the eastern suburbs of Yichang, is presently the city's main train station. It is the junction point of two segments of the Shanghai-Wuhan-Chengdu Passenger Dedicated Line, one of China's new east–west rail mainlines. To the east, the Hanyi Railway  (opened June 29, 2012) provides frequent service to Wuhan, with some trains continuing to Nanjing and Shanghai. To the west, the Yiwan Railway (Yichang-Wanzhou; opened December 2010) serves as the gateway to Hubei's southwestern panhandle (Enshi), with some service continuing to Chongqing and Chengdu. Yichang has a population of 4,150,000 with urban population of 1,338,000. Yichang prefecture-level city, is home to many members of the Tujia ethnic group, who mostly live in several counties in the south-west of the prefecture. Jingzhou is a prefecture-level city in southern Hubei, China, located on the banks of the Yangtze River. Based on the 2010 census, its total population was 5,691,707, 1,154,086 of whom resided in the built-up area comprising the two urban districts. Enshi Tujia and Miao Autonomous Prefecture is located in the mountainous southwestern corner of Hubei province, People's Republic of China. It forms Hubei's southwestern "panhandle", bordering on Hunan in the south and Chongqing Municipality in the west and northwest. The Yangtze River crosses the prefecture's northeastern corner in Badong County. The Xiling Yangtze River Bridge, is a suspension bridge over the Yangtze River, just a few kilometers downstream from the Three Gorges Dam. The bridge is located within Yiling District of the prefecture-level city of Yichang, connecting the towns of Taipingxi and Letianxi with Sandouping. Xiling is a district of Yichang, Hubei, People's Republic of China. It includes the central part of Yichang's urban area, on the left (northwestern) bank of the Yangtze River. The Hunan–Hubei–Sichuan–Guizhou Soviet, was a revolutionary base area and constituent part of the Chinese Soviet Republic (1930–1935). Yiling District is a district of the prefecture-level city of Yichang, Hubei province, People's Republic of China. Created on July 30, 2001, the district includes most of the former Yichang County, with the exception of Yichang center city and certain southern and western suburbs. Sandouping is a town in Yiling District of Yichang prefecture-level city in the Chinese province of Hubei. It is located on the right (southern) bank of the Yangtze River, next to Yiling District's border with Zigui County to the west. Sandouping is best known as the location of the Three Gorges Dam, which is the world's largest electricity-generating plant of any kind. Dianjun District is a district of the city of Yichang, Hubei, People's Republic of China. In 2004 it had 105,175 residents. 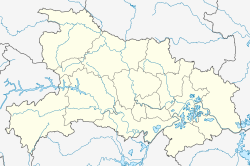 Yidu is a county-level city in western Hubei Province, China. It is under the administration of the prefecture-level city of Yichang. It has a population of 395,000 residents, and covers an area of 1,357 square kilometres (524 sq mi), divided into 1 subdistrict, 8 towns, and 1 township. Its GDP in 2015 was 50 billion yuan. Changyang Tujia Autonomous County is an autonomous county in western Hubei province, People's Republic of China. It is under the administration of the prefecture-level city of Yichang. Wufeng Tujia Autonomous County, formerly Changle County, is a county in the west of Hubei province, People's Republic of China, bordering Hunan province to the south. It is under the administration of the prefecture-level city of Yichang. It is twinned with Westfield, Massachusetts, United States. Qianjiang District is a district in the southeastern part of Chongqing Municipality, People's Republic of China, bordering Hubei province to the east and northeast. While it is governed as a district, in practice Qianjiang is its own city proper far removed from the urban centre of Chongqing. The Miao and Tujia ethnic groups constitute 50.03% of the Qianjiang population, the other half being mostly Han (49.94%). Qianjiang is nicknamed "The Throat of Sichuan and Hubei" (川鄂咽喉) because it sits on the intersection of Sichuan-Hubei and Sichuan-Hunan Roads. Dzao Min, is a Hmong–Mien language of China. 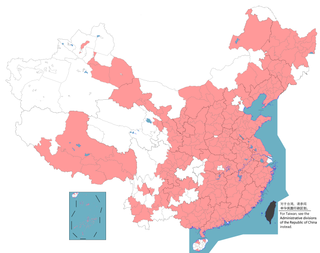 Mao (2004:306) reports a total of more than 60,000 speakers in Liannan County and Yangshan County of Guangdong, and in Yizhang County of Hunan. The speakers from Bapai, Guangdong are also called Bapai Yao (八排瑶族). Taipingxi Town is a town in Yiling District of Yichang Prefecture-level city of China's Hubei Province. It is located on the left (northern) side of the Yangtze River, near the northern end of the Three Gorges Dam. ↑ 抗战中的宜昌大撤退：保留中国抗战工业命脉的壮举. 15 April 2015. ↑ 宜昌市2010年第六次全国人口普查主要数据公报 (in Chinese). Yichang Statistics Bureau. May 30, 2011. Retrieved 5 December 2013. ↑ 宜昌市土地利用总体规划（2006－2020年） (in Chinese). Yichang Bureau of Land Resources. Nov 18, 2013. Retrieved 5 December 2013. ↑ 中国地面国际交换站气候标准值月值数据集（1971－2000年） (in Chinese). China Meteorological Administration. Archived from the original on 2013-09-21. Retrieved 2010-05-04. ↑ "History of Yichang" (in Chinese). Official website of Yichang Government. 2007-09-19. Archived from the original on 2008-04-21. Retrieved 2008-06-06. Wikimedia Commons has media related to Yichang . Wikivoyage has a travel guide for Yichang .